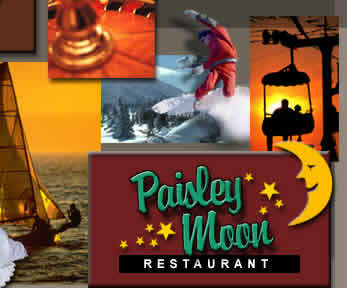 The Kewadin Inn is home to one of Orillia's favourite dining spots - The Paisley Moon Restaurant. Brightly lit, with a colorful Euro-design, the Paisley Moon attracts a growing list of people who enjoy family meals or just getting together with friends for drinks and appetizers. The friendly service, excellent food and great value keep them coming back. The Paisley Moon Restaurant offers an extensive menu from delicious appetizers, to grilled steaks, to vegetarian selections. We offer something for everyone. We are open seven days a week for breakfast, lunch and dinner. PAISLEY MOON PRIVATE ROOM - Enjoy the privacy of your very own room for groups from 5-50. Weddings, anniversaries, birthday parties, or small meetings. a great place for a get-together for any occasion. Yuk Yuk's - Valentine's Weekend, Mother's Day Weekend, New Year's Eve, and our Halloween Spooktacular! New Year's Day, Valentine's Day, Easter Weekend, Mother's Day Weekend, Father's Day Weekend, Thanksgiving Weekend, Christmas and Boxing Day, New Year's Eve celebration.